I arrived in Hanoi from Mumbai, yesterday morning. I am here for an investor conference on the Vietnamese economy. This communist nation is considered by Asia experts as a mini-China in it's sunrise stage. I got in a few days early to take get some much needed R & R and enjoy this exotic French Colonial era town, with a 1000 year history. 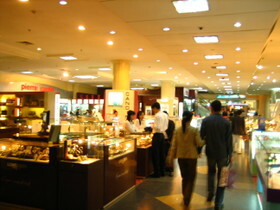 The Hanoi airport is a small relatively modern airport (compared to many Indian airports). I had to wait for about an hour to get my visa on arrival. 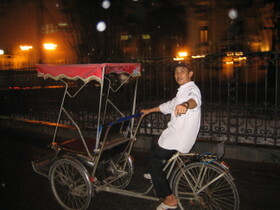 After that, I was off on a cab heading to my hotel in the city ($10 for a 45 minute ride). Hanoi's facade reminds me a bit of small towns in India, except Hanoi is cleaner. The traffic is just as chaotic with lots of Honda mopeds and scooters weaving in and out of traffic. There is a lot of vehicular pollution and many bikers wear masks to cover their mouths. Luckily, the French quarter is not as crowded and the traffic is bit lighter. The driver spoke no English and in the end tried to charge me twice as much but I was firm and paid him the $10 bill I had shown while negotiating. I was exhausted from the overnight flight and crashed for a few hours before heading out in the evening. I started my evening at a local cafe near my hotel, which is conveniently located in the old French quarter of Hanoi. As I gazed out out on the streets, sipping local mint tea, I was feeling pretty relaxed and started flipping through my lonely planet guide to plan the evening. I found a few restaurant choices and a nightclub to complete the evening. As I headed back to my hotel to get ready for the evening, I walked past a busy alley where I a lot of teenagers on bikes were entering and exiting. Curious, I stepped in and found that it led to a local ice cream shop selling sticks of delicious milk and milk chocolate ice cream. 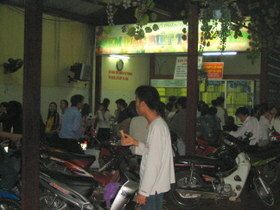 It turned out to be a local favorite with city's teenagers who come here to have ice-cream with their friends. 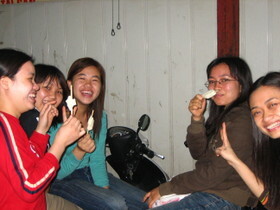 The ice-cream was delicious and I got talking to some kids who wanted to practice their English with me. I took some pics of my new friends and proceeded to a local mall. The mall was pretty dead and I guessed that consumerism was still in its early stages in the economy here. However, I saw quite a few popular European brands. 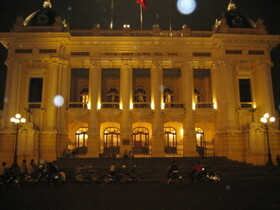 I picked up some Evian water bottles for the toom and headed back to my hotel which is right next to the Hanoi Opera. The Opera house has beautiful architecture and looks stunning at night. I had dinner at a restaurant called Bobby Chinn. It's considered to be the coolest (and one of the most expensive) restaurants in Hanoi. 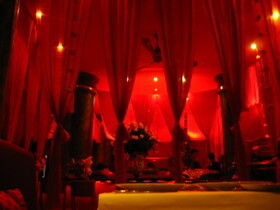 I liked the funky red decor and the lively vibe of the restaurant. The owner is a part Vietnamese and part Egyptian and has developed an eclectic menu of Asian and Western cuisines for his largely expat client base. I liked the music there-mostly French Nouvea Jazz. I have to go back to take a copy of the drinks and food menu. The menu descriptions are laced with some of the funniest comments I have seen at any restaurant, starting with 'we refuse to play Bee Gees or for that matter any boy band music here'... and the rest was in the same vein. The highlight of the evening was the New Century nightclub, a loud Euro style thumping nightclub with laser lights, smoke machines and skimpily dressed dancing girls on raised podiums across the floor. The crowd was pretty young and the scene could have been from any big city in the world. It's amazing how the current dance club culture is so uniform across all boundaries. The DJs were spinning were spinning some mean tracks and every once in a while the crowd would go wild as they would tune in an old favorite along with 'special effects' like a cloud of balloons and glittering confetti. I wasn't allowed to take in my camera but I have some camphone pix which I will add here once I transfer them to my laptop. More Hanoi posts to follow.